District And Sessions Judge, Kailashahar LDC Govt Job 2019 Syllabus Check Here. District And Sessions Judge, Kailashahar Notification is out. 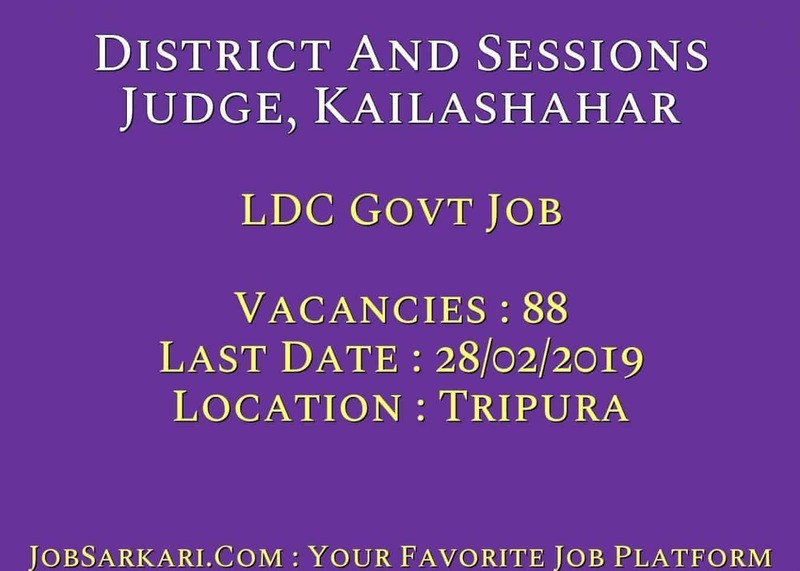 District And Sessions Judge, Kailashahar is recruiting for 88 LDC Govt Job Posts. You can check District And Sessions Judge, Kailashahar - District and Sessions Court Kailashahar last date, download District And Sessions Judge, Kailashahar notification, visit District And Sessions Judge, Kailashahar official website and check other District And Sessions Judge, Kailashahar Vacancy details.Complete Vacancy and recruitment Details about 88 LDC Govt Job vacancies in District And Sessions Judge, Kailashahar are provided below by JobSarkari.Com only for you. Last Date of Receipt Application Form. 28/02/2019. Mode of Payment. Candidate Need to Pay Application Fee Through Demand Draft in Favour of District And Sessions Judge, Unakoti District, Kailashahar, Payable At Kailashahar. LDC (Group C). Candidate Must Have Passed Graduation in Any Discipline With Certificate in Computer of 6 Months And Having Typing Speed 30 WPM. 88. Age Relaxation. 5 Years For SC/ ST/PH. 4. Candidate Need to Send the Application Form on Given Address on or Before 28th February 2019. Office of the District And Sessions Judge, Unakoti District, Kalashahar. Q. What is the Last Date For District And Sessions Judge, Kailashahar LDC Govt Job Vacancy ? A. 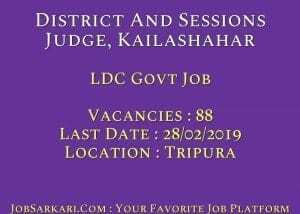 Last Date for District And Sessions Judge, Kailashahar LDC Govt Job Posts is 28/02/2019. Q. What is the Form Type of District And Sessions Judge, Kailashahar LDC Govt Job Recruitment ? A. The Form Type for District And Sessions Judge, Kailashahar LDC Govt Job Posts is Online. Q. How many vacancies are available in District and Sessions Court Kailashahar LDC Govt Job Posts ? A. There are about 88 Vacancies in District and Sessions Court Kailashahar LDC Govt Job Posts. Q. What is the Full Form of District And Sessions Judge, Kailashahar ? A. Full Form of District And Sessions Judge, Kailashahar is District and Sessions Court Kailashahar .